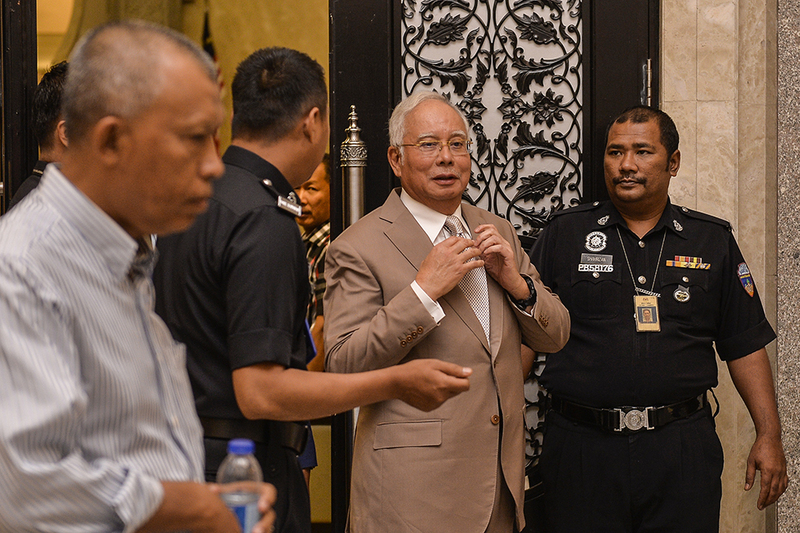 KUALA LUMPUR, March 27 — Datuk Seri Najib Razak’s case over RM42 million belonging to former 1Malaysia Development Berhad (1MDB) unit SRC International Sdn Bhd may proceed in the High Court, the Federal Court ruled today. Chief Justice Tan Sri Richard Malanjum, who chaired a seven-man panel at the Federal Court, delivered a unanimous decision to set aside the stay granted by the Court of Appeal on the trial. “We are unanimous in our view that in granting the stay of proceedings by the Court of Appeal, we are of the view that there’s no jurisdiction to do so. “As such, we set aside the order of the stay and now we remit this matter to the High Court for proper action. We remit it forthwith and let the High Court take it from there,” he said. The other judges on the panel today are Chief Judge of Malaya Tan Sri Zaharah Ibrahim, Chief Judge of Sabah and Sarawak Datuk Seri David Wong Dak Wah, Tan Sri Ramly Ali, Datuk Rohana Yusuf, Datuk Mohd Zawawi Salleh, and Datuk Tengku Maimun Tuan Mat. 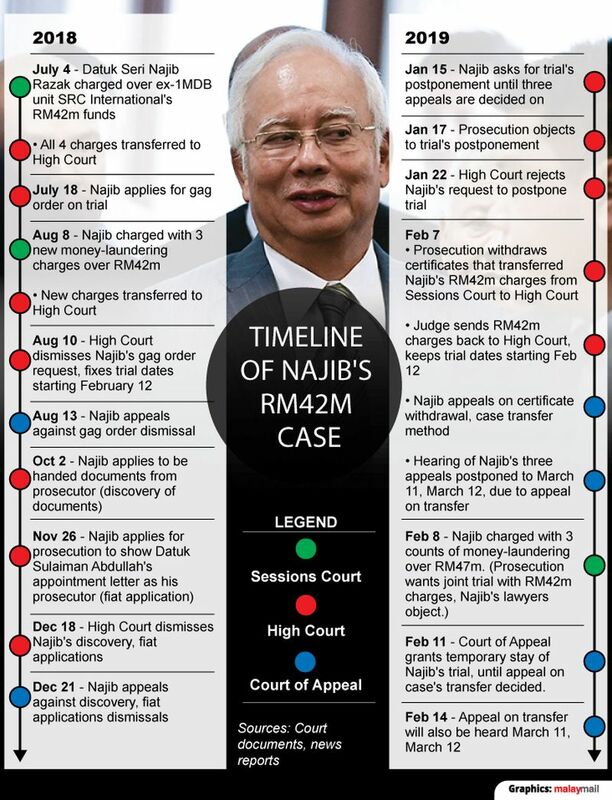 Najib’s trial was initially scheduled to start from February 12 and run until March 29, but was put on hold twice by the Court of Appeal on February 11 and March 21 pending related appeals. Today is the hearing of the prosecution’s appeal against the stay granted by the Court of Appeal on March 21, when it had allowed Najib’s trial to be halted until the Federal Court decides on three appeals. The Federal Court will hear four appeals — three appeals by Najib and also an appeal by the prosecution — on April 4. 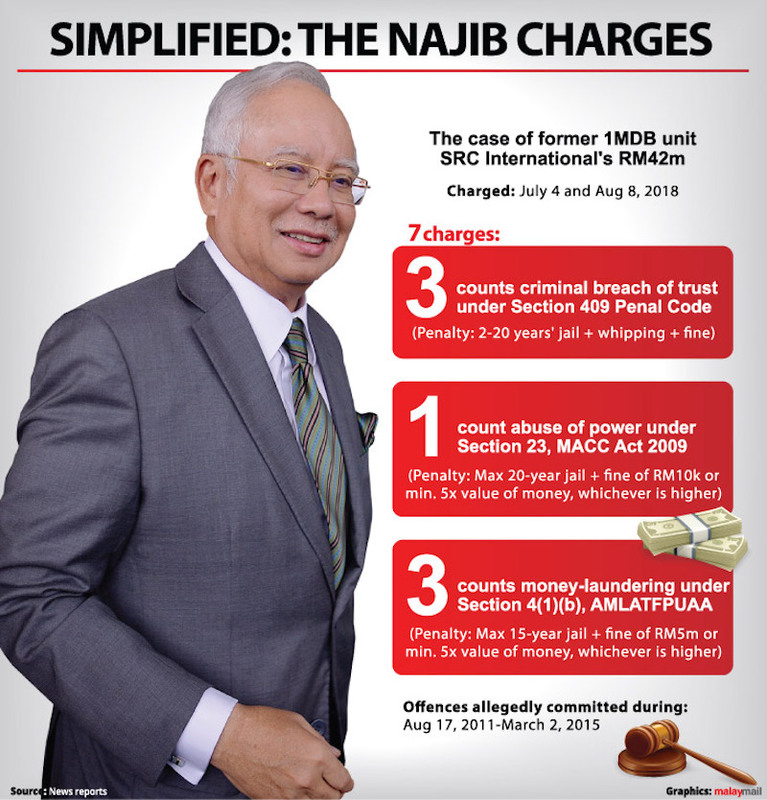 Najib’s three appeals are over how his RM42 million case was transferred from the Sessions Court to the High Court, his previously unsuccessful application for a gag order to prohibit the media from discussing the merits of his criminal cases, and his unsuccessful application to be given certain additional documents from the prosecution ahead of the trial. The prosecution’s appeal is against Najib’s successful challenge of the appointment of senior private lawyer Datuk Sulaiman Abdullah as his lead prosecutor in this case. Immediately after the Federal Court’s ruling to set aside the stay order, Najib’s lawyer Harvinderjit Singh made an oral application for a brief stay of the court’s decision today until April 4 as the four appeals will be heard then. “These (four appeals) are novel issues to be decided by the Federal Court and there’s every possibility if trial carries on would be rendered a nullity,” he said, but his request was objected to by Attorney General Tommy Thomas. The Federal Court dismissed the request for a stay of today’s decision. When met after the Federal Court’s decision, ad hoc prosecutor Datuk V. Sithambaram said the Federal Court’s decision today means the trial for Najib can start. “The stay at the Court of Appeal has been set aside, which means there’s no impediment for the trial to start,” he told reporters outside the Federal Court courtroom. “The order of the court is for us to forthwith contact the High Court registry for the purpose of fixing case management date with the view of fixing trial dates, so we will be doing it immediately,” he said. When asked how soon the trial could start, Sithambaram said the trial dates would have to be fixed by the High Court judge subject to his available dates. “When it comes before him, he has to look at his calendar and fix the dates,” he said, confirming that the judge will also check with lawyers for both Najib and the prosecution when fixing trial dates during case management. When asked if trial can start this Friday (March 29) itself, which is the last remaining trial date set so far, Sithambaram indicated that it may not be possible as witnesses have to be subpoenaed for the trial. Najib faces a total of 42 charges in several cases, including his seven charges over the funds said to belong to SRC International. 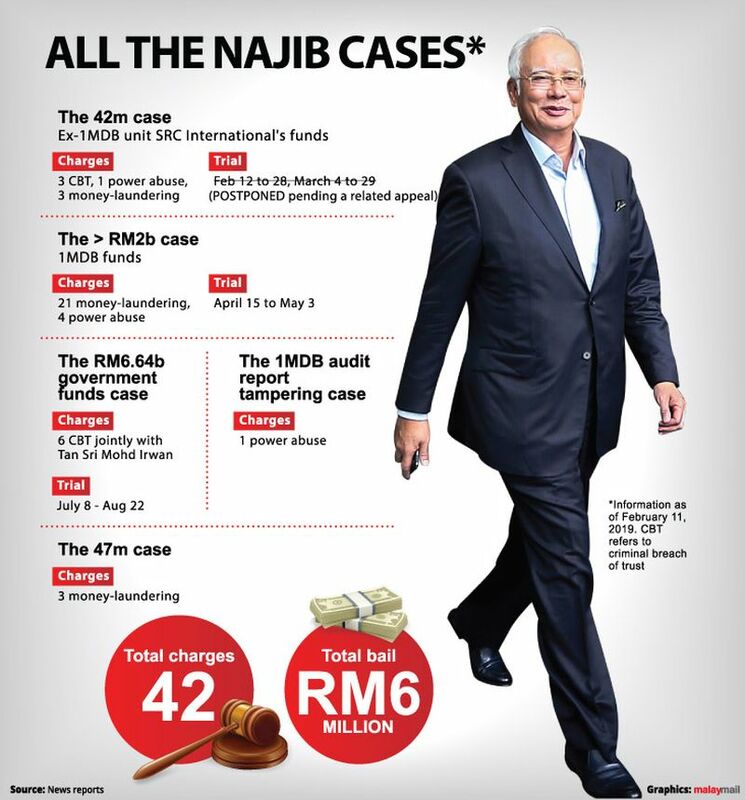 Najib’s trial in two of these criminal cases are set to start on April 15 and July 8 ― namely 25 charges over more than RM2 billion of 1MDB funds, and also criminal breach of trust of some RM6.64 billion of government funds.